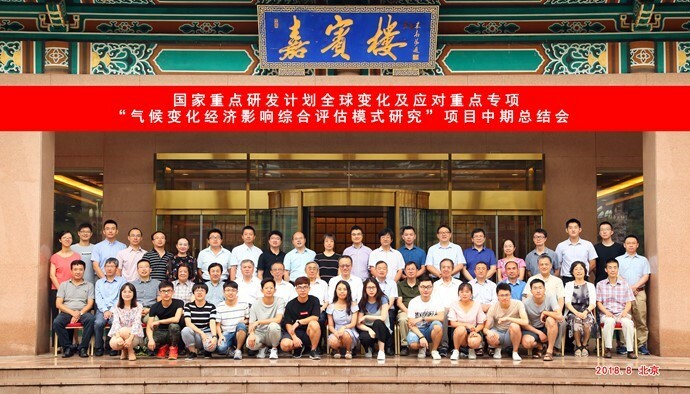 The Mid-term Summary Meeting of the National Key Research and Development Program “Integrated Assessment for the Economic Impacts of Climate Change” was successfully held in Beijing on August 12, 2018. The program is led by Professor Wei Yiming from Beijing Institute of Technology. In the opening ceremony, lectures were respectively given by Chen Jiangyao, who is the project director of the Science and Technology Department of the Ministry of Industry and Information Technology and represents the project recommendation party, and Professor Long Teng, who is the vice president of Beijing Institute of Technology and represents the project undertaker. Professor Wei Yiming, the project leader, presided over the opening ceremony. The expert group consists of 13 expert as like Professor Chen Jingming, who is the project responsibility expert and academician of the Royal Canadian Academy of Sciences, Professor Shi Minjun from Zhejiang University, Academician Ding Yihui from National Climate Center, Researcher Dai Yande from Energy Research Institute of National Development and Reform Commission, Researcher Yu Jingyuan from China Aerospace Science and Technology Corporation, Researcher Li Shantong from Development Research Center of the State Council, Researcher Xia Guang from the Ministry of Ecology and Environment, Researcher Duan Xiaonan from the Chinese Academy of Sciences, Researcher Lin Erda from the Chinese Academy of Agricultural Sciences, Researcher Chao Qingchen from the National Climate Center, Researcher Ma Zhuguo from the Institute of Atmospheric Research of Chinese Academy of Sciences, Researcher Cheng Xiaotao from Chinese Academy of Water Sciences, researcher Wei Wei from the Shanghai Institute of Advanced Studies of Chinese Academy of Sciences. More than 50 academic researchers from Beijing Institute of Technology and other institutions all participated in this meeting. The mid-term summary meeting of the project was co-chaired by the academic team leader Ding Yihui and Academician Chen Jingming. At the mid-term summary meeting, Prof. Wei Yiming, the project leader, gave a brief report on the overall progress of the “Integrated Assessment for the Economic Impacts of Climate Change”. Professor Ma Zhongyu from the National Information Center, Prof. Shi Xueli from the National Climate Center, Prof. Wei Yiming from the Center for Energy and Environmental Policy of Beijing Institute of Technology, and Professor Guan Dabo from the University of East Anglia, UK, respectively reported on their own R&D tasks and the assessment indicators of their respective projects, main research results, personnel training and organization and management, use of funds, and future research plans. After the expert group had listened to the interim report of each topic, and had carefully reviewed the medium-term implementation report and technical documents of the project, the experts present highly appreciated the research results obtained by each topic, and drew that each topic is working well on their respective research tasks and comes to positive mid-term assessment indicators. Significant progress has been made in researching results in regards to building a comprehensive climate change assessment model involved with China's independent intellectual property rights, improving global and regional economic system models, developing global system models for comprehensive assessment of rapid and effective climate change, assessing the socio-economic impacts of climate change on key areas, and establishing a database and platform for comprehensive assessment and analysis of climate change. Some of the results support the country's strategic decision-making and enjoy certain international influence. In addition, the expert group also presented constructive suggestions on future development and improvement.